Silver gelatin B&W printing doesn’t have to be onto paper- this is of course the easiest choice, because papers are readily available from Kodak, Ilford, Bergger, etc. In this article I will explain how I print onto glass, which is one of my favorite surfaces. 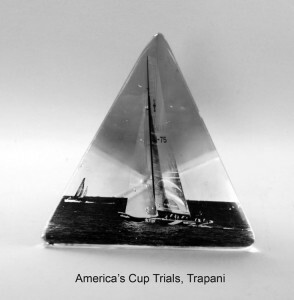 The glass can be anything from window panes to costly hand blown Steuben, but in this example I have used a pyramid-shaped piece of cast glass I have made, measuring about 5” high and 4” wide [Figures 1,2]. I will explain how the glass is poured and finished another time. Another challenge, and perhaps the most important, is to print the right kind of photograph on the right shape of glass. In Fig. 1, I believe that the tall 12 meter yacht belongs nicely on the triangle. On the other hand, a complex landscape picture, or even a Maine lighthouse photo, would seem out of place. In other words, the viewer does not want to have the glass piece overpower the photo.